Zen of 180 Blog: LSAT Statistics: How many people take the LSAT? In case you want to know more about the numbers behind the LSAT, Zen of 180 has a whole section devoted to analyzing LSAT statistics. In today's post, we'll take a quick look at the changes in the number of people who sit for an LSAT. The graph pretty much speaks for itself, but it's interesting to note that the rapid decline in testtakers since the Great Recession has actually only returned the numbers to their historic averages. 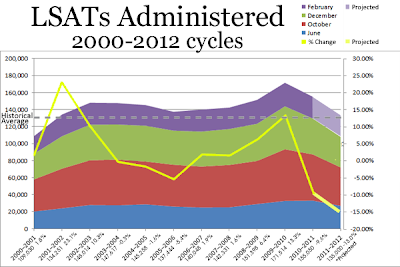 Area graph with percentage change overlay for LSATs administered since 2000. Note that the February 2012 statistics are projections. Of course, when you take into account population growth, this means that a smaller percentage of the population is taking the first step in going to law school. That's probably a good thing for the legal industry, and will perhaps help correct the market influx of students during the recession. [Many law schools are] ranked in the bottom third of all law schools in the country, but with tuition and fees now set at [nearly $50,000 a year,] charge more than Harvard. [Many have] increased the size of the class[es] by an astounding 30 percent, even as hiring in the legal profession imploded. [And, worst of all, these schools] reported in the most recent US News & World Report rankings that the median starting salary of its graduates was the same as for those of the best schools in the nation — even though most of its graduates, in fact, find work at less than half that amount. In short, we just want to make sure that you really want to go to law school before you start the arduous task of preparing for the LSAT.